Reinvent dinnertime with with quick, easy, delicious Chicken Shake’n Bake. This homemade tasting chicken coating is sure to become a family favorite. Preheat oven to 400F. Moisten chicken with water. 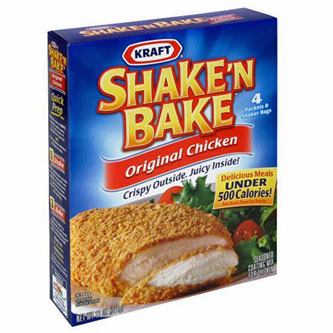 Place breasts in Shake-n-Bake shaker bag. Shake the bag vigorously to coat the chicken. Bake for 20 minutes if boneless, 45 minutes if it does have bones.